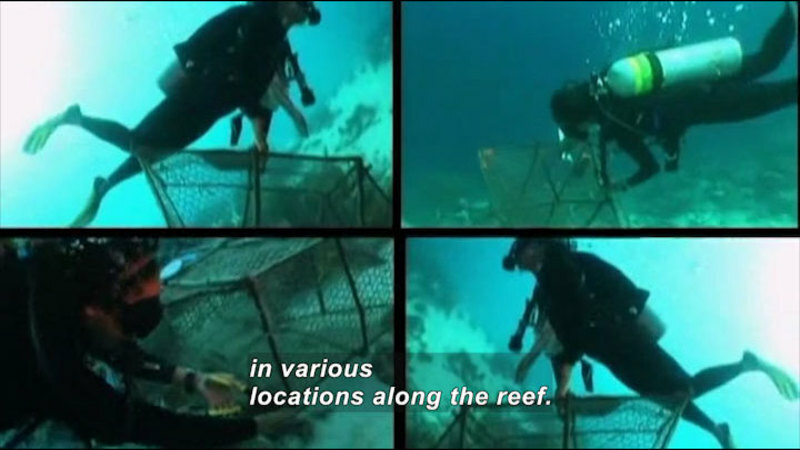 (Describer) In various scenes, a woman puts on a lab coat, a bike helmet, dark glasses and scuba goggles. With the glasses, she views a huge 3D projection of a chemical model. (Describer) She walks past computer servers and zips up a wetsuit. (woman) My name is Rommie Amaro. (Describer) She goes paragliding off a cliff. (Describer) Riding with a man, she sails over a beach. (male narrator) Rommie is one scientist who's always trying something new-- both at play and at work. See that hole, where it just really binds inside? Yeah, that's fantastic. I am a computational and theoretical biophysical chemist. I am a computational and theoretical biophysical chemist. 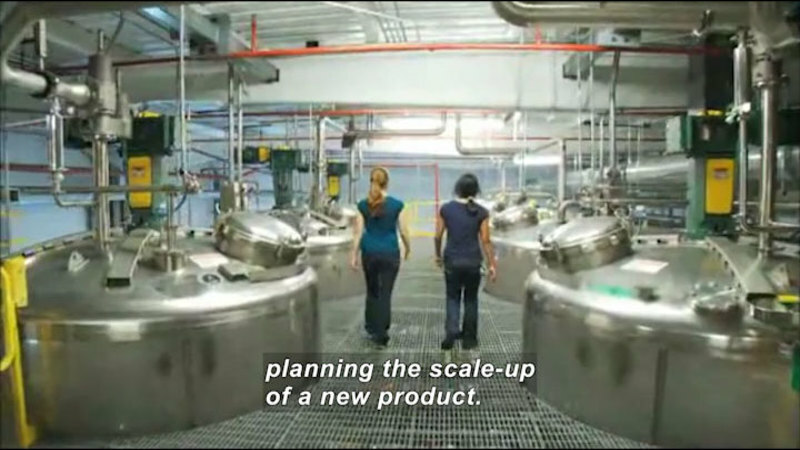 (Describer) She and a colleague look at a computer monitor. (Amaro) We're currently working on African sleeping sickness and avian influenza, or bird flu. (narrator) It's a job that combines biology, chemistry, physics, computer science, and math. 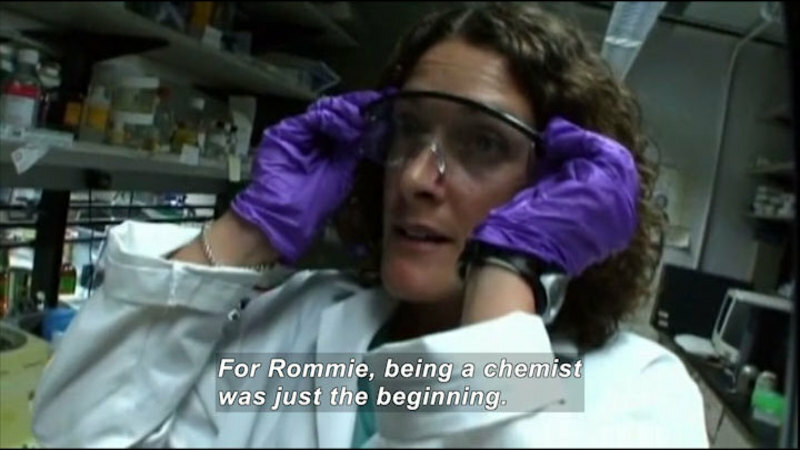 For Rommie, being a chemist was just the beginning. (Amaro) After I graduated from the University of Illinois in Chemical Engineering, I worked for Kraft Foods doing really traditional chemical engineering projects-- actually working on Philadelphia Cream Cheese, which was fun. (Describer) She walks toward a large glass building. (narrator) Always looking for a challenge and to make a real difference, Rommie got her PhD and went to UCSD Center for Theoretical Biological Physics, where collaboration is a huge part of discovering new drug treatments. (Amaro) Many people think that scientists work alone in either the lab or their office, and they don't talk to other people. But that is really not the case. (Describer) She and two colleagues wear big dark glasses as they look at another image. The same thing's happening with this carboxylic group situating itself. (narrator) Rommie works closely with supercomputer scientists, computer imaging designers, and lots of other scientific experts throughout the research process. We start with a protein structure, and then we use our programs to basically build a simulated system. (narrator) Once they've simulated the protein system with computers, they can then use computers to predict how the protein systems act, and how a drug can change the structure of a molecule. (Amaro) Once we have our Molecular Dynamics Simulations data, we can visualize how these proteins are moving, either on a desktop computer screen or in a 3D visualization center or in a virtual reality center. 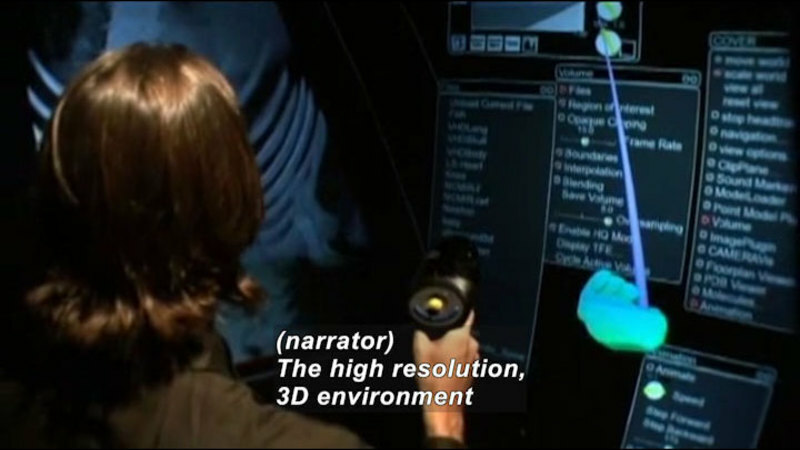 (Describer) In the virtual reality center, she uses the controller to turn the image. (Amaro) This is a protein involved in African sleeping sickness. We're trying to develop drugs that will bind inside this protein and prevent it from working. This is really great. Typically, this is about a billionth of a meter in size. (Describer) She works in a lab. (narrator) From there, Rommie collaborates with lab scientists to verify her computer models. And success means possibly a new drug that will save lives. (Amaro) It's a really fantastic feeling. (narrator) But it also means a lot of work and patience. It's the most fun part of science when it works, because it's a discovery, and it's exciting. But it's also frustrating sitting in the lab when it's not working. (narrator) Long hours and dedication are part of the job. It doesn't feel like work. Science is a lifestyle. It's a hobby. Definitely, it's an intense job. But it's not like a typical 40-hour work week. (Describer) She and two others work at laptops. I'm just running the access. It's a timestamp. (Amaro) Being a biophysical chemist is financially rewarding, but this job's best benefits are the fringe benefits. You get to travel, feel really good about your work, you get to work with outstanding colleagues. (Describer) At home, she sits on a couch with a cat. (narrator) Rommie also makes time for herself, either to chill or to crank it up a notch. (Describer) She swims, runs and bikes. (Amaro) It was an awesome race, and I feel fantastic. (Describer) After getting off the bike, she runs. I absolutely love working out. I love triathlon sports and running. (Describer) She heads into ocean waves at night, and comes out. Awesome. Rommie always leaves room for friends and family. You don't want to miss that one. (Describer) In a kitchen, she puts food on skewers. (Amaro) That's very important. I've always tried to maintain that in my life. (Describer) She puts them on a grill outside. (narrator) What's it take to become a computational and theoretical biophysical chemist? You're probably going to take a lot of math courses, maybe some computer science courses, lab courses, of course a lot of chemistry courses. 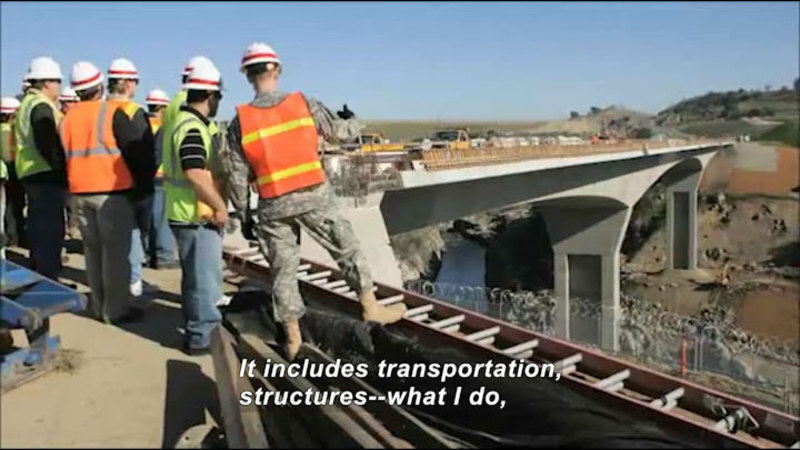 You take a lot of courses in engineering, as well as traditional science areas. (narrator) For Rommie, science is an adventure of a lifetime. (Describer) She works in the virtual reality center. (Amaro) When you combine love of science and discovering exciting new things with your job, it's a rewarding experience. Beautiful, now we can see the surface of the protein. (Amaro) I feel like my work is going to have a positive outcome in this world. (Describer) Paragliding over the beach, she and her partner land in a field, then let the parachute fall. 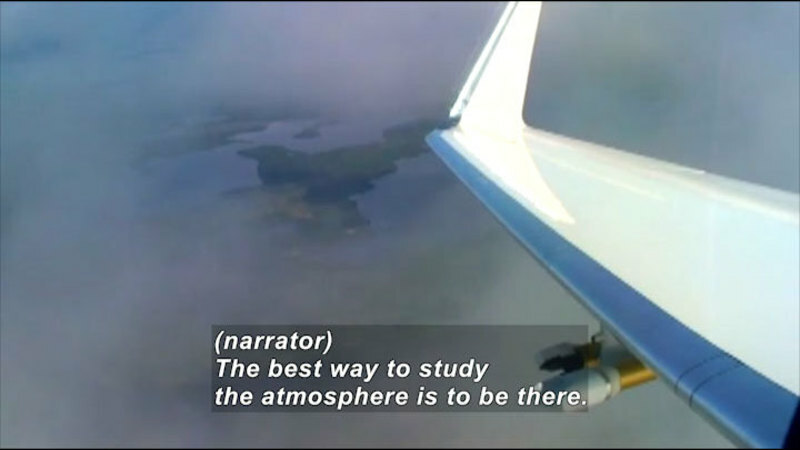 When you're a scientist, the sky's the limit. This is awesome. Sweet. That was incredible. Awesome! 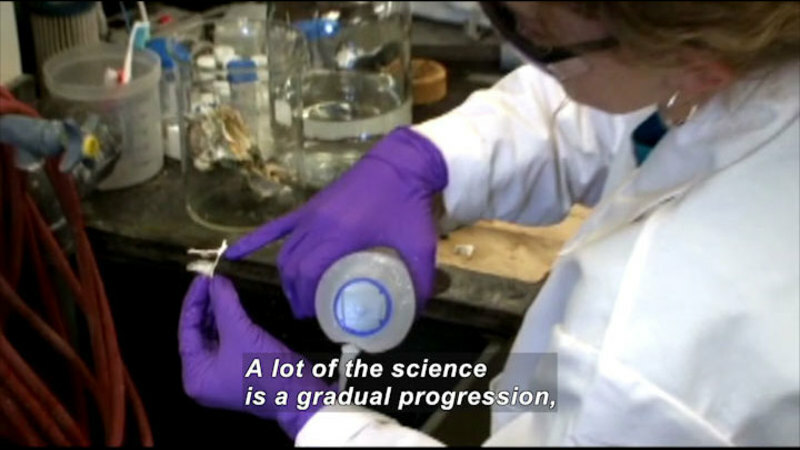 Spend a day with Rommie Amaro as she explains what it’s like to be a biophysical chemist.